A late 365 (BlueWater) just departed New Buffalo about 15 minutes late. The Pere Marquette is a 3-car all-Horizon consist today. While in prior years they have usually run with Horizons in the summer (usually 4) and Superliners in the winter, this year has been almost exclusively Superliners year-round. NPCU and SC44 for power, as usual. 350 clear 30E with an FRA inspection car on the rear of the consist. Amtrak # 350 on time at Dearborn, MI. Private Pullman car on rear, NX-Trak. KenB wrote: Amtrak # 350 on time at Dearborn, MI. Private Pullman car on rear, NX-Trak. What train will it come back on? It went back that night on 355. When the brass or inspection stuff comes it normally goes 350-355 so it's in Chicago same day. It was an inspection car. Amtrak 350 today had Genesis #30 with a classic alternating set of Amfleet, Horizon, Amfleet, Horizon (4 coaches) and a Northeast Corridor Amcafe. No rear unit! 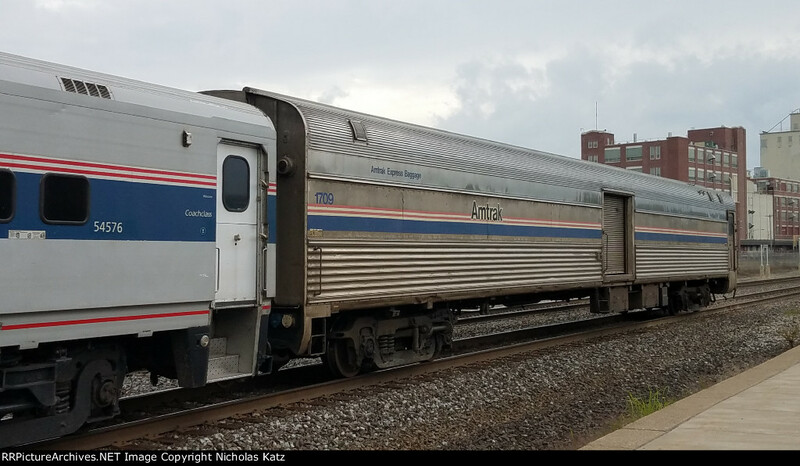 GP30M4216 wrote: Amtrak 350 today had Genesis #30 with a classic alternating set of Amfleet, Horizon, Amfleet, Horizon (4 coaches) and a Northeast Corridor Amcafe. No rear unit! Amtrak engine#30 will pull train#353 from PNT to CHI this morning, Sunday, September 16, 2018. Amtrak #350 was lead by #32 today, and had baggage car #1709 on the back end.